Alan Stuart Franken aka. 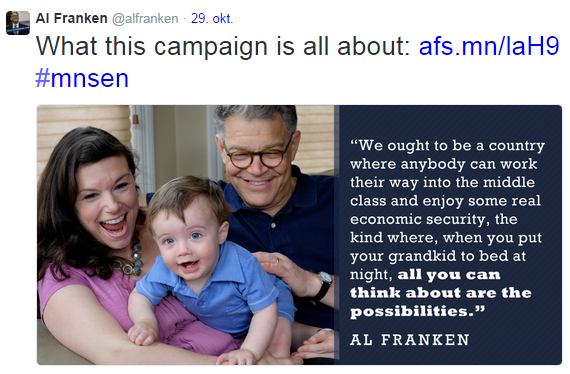 Al Franken is an American politician and comedian. Since 2009 he has been a senator for the state of Minnesota and this fall he is running again. Franken attended Harvard University and majored in government. Before turning to politics Al Franken was a writer and an occasional preformer on “Saturday Night Live”. First from 1975-80 and then returning from 1985-95. After 1995 Franken wrote a number of books of which four made the New York Times best selling list. From 2004 until 2007 Franken hosted the radioshow “The Al Franken Show” which aired tree hours a day, five days a week. When Franken was elected senator in 2009 he was one of the biggest supporters for the single-payer system. The single-payer system is a system in which the government, rather than private insurers, pays for health care costs. The system would be funded by the tax payers. Much like the Norwegian system. He voted for the much discussed “Afordable care act” aka. Obamacare. For his run for the senate this fall the focus of his campaign has been to make sure everyone has the same opportunities.